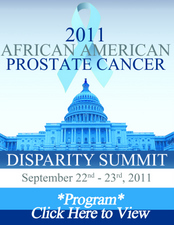 The 2011 summit was hosted on Thursday, September 22nd at the U.S. Capitol Building and Friday, September 23rd at the Washington Convention Center as a part of the Congressional Black Caucus Annual Legislative Conference. The Thursday session focused on what has been learned through research and studies over the past seven years about the African American prostate cancer disparity. The session addressed the questions of what definitive approaches can now be taken to reduce or eliminate the disparity based on scientific evidence, and where new research efforts should be focused. The session also reviewed new treatments and clinical trials and their potential impact on the disparity. The Friday session focused on PHEN's community education and outreach efforts with its partners. The 2011 national "Father's Day Rally Against Prostate Cancer" was reviewed for its education and awareness impact. Its success in engaging the leadership within Black America in the fight against prostate cancer was also a topic, along with PHEN's monthly live webcasts targeting prostate cancer survivors and men newly diagnosed. How to most effectively utilize PHEN's outreach capabilities to educate about new treatments and clinical trials and to increase access and participation for those most impacted by the disease was a primary topic. The full program for both days of the summit is available on this page. 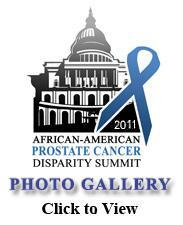 African American men have a 60% higher prostate cancer incidence rate than other men in the United States. Reducing this incidence rate could have a major impact on the overall disparity suffered by Black men. At PHEN's 7th Annual African American Prostate Cancer Disparity Summit Dr. Gerald L. Andriole, Chief of Urologic Surgery at The Washington University School of Medicine in St. Louis, presented on the results of a clinical trial that showed a 22% reduction in the risk of prostate cancer. He also outlined ongoing efforts in this area. PHEN has a major emphasis on educating men and their families about new prostate cancer treatments and clinical trials. Each of its monthly webcast highlights a specific effort within these areas. The summit featured presentations on some of the most promising prostate cancer medical innovations. Presentations were made by Dendreon, Amgen, Medivation, Oncogenex, and BN Immunotherapeutics. Jacques Carter, MD, who presents treatment options during the PHEN monthly webcasts, moderated this summit session.